He asks conservatives to reject the bipartisan budget and endorse a 60-day temporary spending plan to buy more time. AUGUSTA – Flanked by about 60 conservative activists, Gov. Paul LePage called on lawmakers Thursday to reject a bipartisan compromise on the state’s $6.3 billion two-year budget. The governor, who reiterated his intent to veto the budget the Legislature passed last week, proposed a 60-day resolution to allow his administration and legislative leaders to broker a new deal. 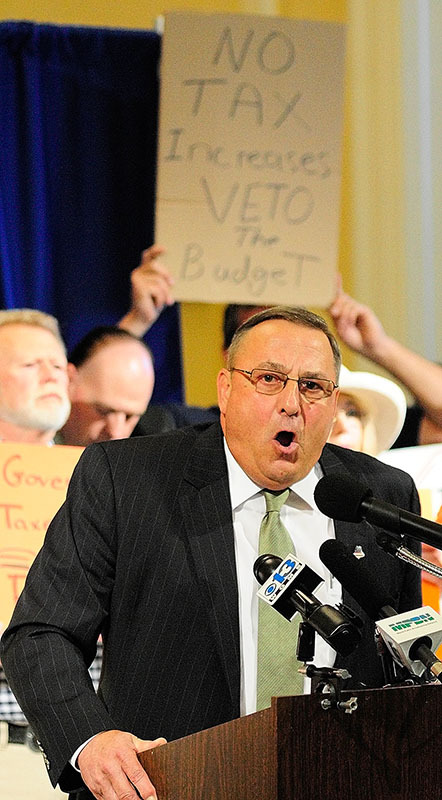 LePage blasted the budget crafted by Republican and Democratic leaders as laden with favors to special interests and unnecessary tax increases. His comments drew enthusiastic cheers from the core group of supporters that helped elect him in 2010. “The only special interest that is not represented here in Augusta is you, the Maine taxpayer,” LePage said. Thursday’s event, designed to build pressure on Republicans to reject the budget, was held in the State House Hall of Flags several hours after the Legislature recessed until Wednesday. The governor’s speech was quickly rebutted by Sen. Troy Jackson, D-Allagash, the assistant majority leader, who said LePage’s initial budget proposal contained several tax increases and a massive shift of the tax burden to property owners. Jackson said it is premature to discuss a 60-day resolution to avoid a government shutdown because lawmakers have the votes to override the governor’s imminent veto. The Legislature must enact a balanced budget by June 30 to avoid a suspension of state services. LePage’s proposed 60-day resolution would buy him time to avoid a shutdown while negotiating with lawmakers. But Attorney General Janet Mills said the Legislature, by law, cannot pass a “continuing resolution” in lieu of a balanced two-year budget. Unlike the federal Constitution, Mills wrote, the Maine Constitution requires a balanced budget. “Any effort to continue the budget that expires on July 1 would result in a budget that is out of balance, given the major differences between the expenditures of the current budget and those of the budget recently passed by the Legislature and sent to the governor for his signature,” wrote Mills, a Democrat. The last government shutdown happened in 1991, with the same political dynamic — a Republican governor and a Democratic-controlled Legislature. The prospect of a shutdown has loomed over this legislative session, although lawmakers appear closer to passing a budget than they were in 1991. Democratic leaders have said LePage is spoiling for a shutdown and dismissed the claim he made Friday that lawmakers have refused to negotiate with him. “Every time we meet with him, it’s been his way or the highway,” Jackson said. LePage said the resistance to negotiate comes from the Legislature, not him. LePage said the budget passed by the Legislature would hurt ordinary Mainers. He said Democratic and Republican lawmakers are responsible for the flawed deal. The activists at Thursday’s event cheered him on. One yelled “cowards!” when LePage criticized fellow Republicans. Sen. Roger Katz, R-Augusta, said Wednesday that he believes the budget compromise will withstand pressure from the governor to reject it. The budget passed by the Legislature contains a temporary sales tax increase, from 5 percent to 5.5 percent and a 1 percent increase in the meals-and-lodgings tax, from 7 percent to 8 percent. Both increases would end after the two years. They would fill a $400 million shortfall created by the tax cut package the Legislature passed in 2011. 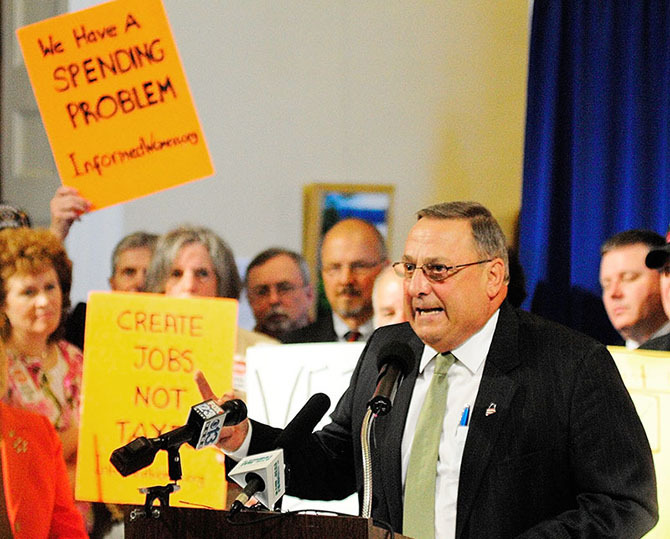 LePage’s budget, proposed in January, was designed to protect the tax cut. Critics of his plan say LePage’s budget proposal contained a $400 million tax increase because of a two-year suspension of municipal aid and changes to other programs that provide property tax relief. LePage’s budget also contained an income tax increase that would have raised the tax bill of the average Mainer by $39 over the next two years. The proposal was noted by the conservative Tax Foundation, which criticized LePage for attempting to “sneak” a tax increase into his budget proposal. The increase was driven by a change in inflation indexing to what’s known as chained consumer price indexing. The subtle but substantive change would have generated more than $8.6 million in income tax collections over the two fiscal years beginning July 1. The Appropriations Committee rejected the proposal. While the governor’s budget would have raised income taxes on the average Mainer by $39 over the next two years, that’s not really a tax increase because it’s intended to keep pace with inflation, said Curtis Ayotte, 33, of Farmingdale. He said the budget compromise passed by the Legislature is much worse. Mary Adams also lauded the governor, calling him a “tax guerrilla,” a term that has been used to describe Adams, who has led several popular referendum campaigns to cap property taxes.